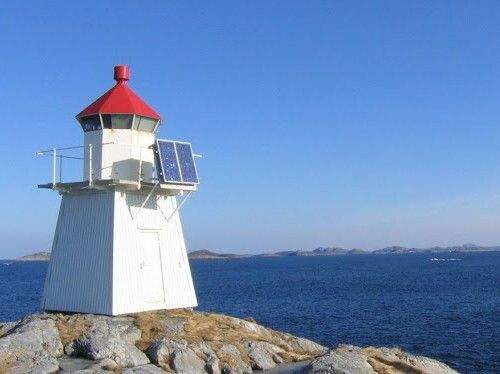 This page lists lighthouses of the municipalities of Nærøy, Vikna, and Leka at the northern end of Trøndelag County in northwestern Norway. 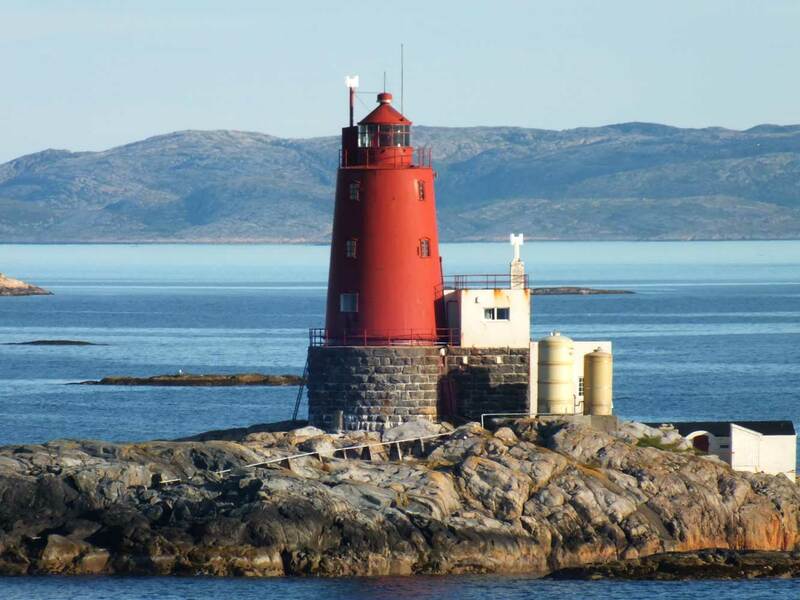 In Norway a lighthouse is simply called a fyr (fire); a smaller beacon is called a lykt (light) . Aids to navigation are maintained by the Kystverket (Coast Directorate), an agency of the Ministry of Transport and Communications. 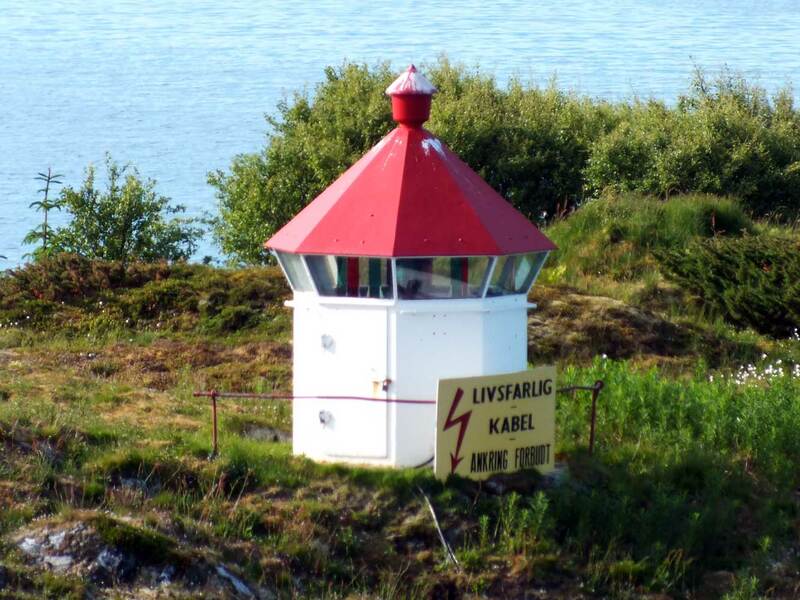 From Norwegian Wikipedia, a handy list of Norwegian light stations with their dates of establishment. Navigational chart for northern Trøndelag. Date unknown. Active; focal plane 8.5 m (28 ft); white, red or green light depending on direction, occulting twice every 8 s. 6 m (20 ft) square skeletal tower with lantern and gallery, covered with siding. Lighthouse painted white; lantern roof is red. Erik Stenvik has a photo, and Google has a satellite view. Located at the western tip of Kjeøy, an island near the east end of the Foldafjord, about 4 km (2.5 mi) southeast of Geisnes. Accessible only by boat. Site open, tower closed. NF-5165; Admiralty L1790; NGA 8760. Date unknown. Active; focal plane 10 m (33 ft); white, red or green light depending on direction, 1 s on, 1 s off. 14 m (46 ft) lantern on a platform supported by piles. Lantern painted white with a red roof. No photo available, and Bing has only an indistinct satellite view of the skerry. Located on a skerry about 3 km (2 mi) south of Nærøy. Accessible only by boat. Site open, tower closed. NF-5256; Admiralty L1828.2. Note: The Vikna municipality includes a large archipelago of small islands off Nærøy, separated from the mainland by the Nærøysund strait. Two bridges cross the strait, connecting the islands to the mainland. The permanent population of the islands is about 4100. Date unknown. Active; focal plane 9 m (30 ft); white, red or green light depending on direction, occulting once every 6 s. 3 m (10 ft) octagonal lantern, painted white with a red roof. Trabas has Siering's closeup photo, and Bing has a distant satellite view. Ships on Norway's inside passage make a tight turn around this light, so it is often photographed. Rørvik is the seat of government for Vikna township. Located on Lille Lyngøy, a small island about 1.6 km (1 mi) east of the Rørvik waterfront. Accessible only by boat. Site open, tower closed. NF-5520; Admiralty L1909; NGA 9032. 1984. Active; focal plane 14 m (46 ft); white, red or green light depending on direction, occulting once every 6 s. 14 m (46 ft) concrete post with lantern and gallery. Lighthouse painted white; lantern roof is red. Trabas has Siering's photo, and Google has a distant satellite view. Located at the shoreline near the historic lighthouse. Site open, tower closed. NF-5515; Admiralty L1904; NGA 9016. 1904. Inactive since 1984. 13 m (43 ft) lantern atop a 2-story wood keeper's house. House painted or stained light brown; lantern painted red. Arno Siering's photo is at right, a closeup 2007 photo and a view from the fjord are available, MarineTraffic.com has Kenneth Yttergard's photo, and Google has a distant satellite view. 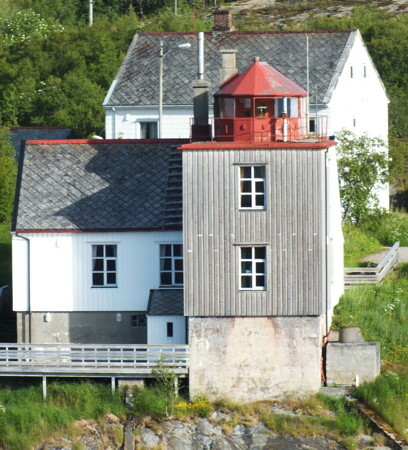 The lighthouse replaced the Prestøy lighthouse on the other side of the Nærøysund. The house has a modern appearance, so probably it has been altered from the original. Located on the north side of the Nærøysund, which separates the island of Vikna from the mainland, about 2 km (1.2 mi) southwest of Rørvik. Site status unknown. ARLHS NOR-175. Date unknown. Active; focal plane 5.5 m (19 ft); white, red or green light depending on direction, 3 s on, 3 s off. 7 m (23 ft) lantern and gallery mounted on four straight piles. Lantern painted white with a red roof, piles painted black. No photo available, but Bing has a distant satellite view. Located on a reef off the southern end of Indre Vikna. Accessible only by boat. Site open, tower closed. NF-5501; Admiralty L1899; NGA 9008. Date unknown. Active; focal plane 6.5 m (21 ft); white, red or green light depending on direction, 3 s on, 3 s off. 6 m (20 ft) square tower with lantern and gallery. Lighthouse painted white, lantern roof red. No photo available, but Bing has an indistinct satellite view. Located on a small island just off the south coast of Mellom Vikna. Site open, tower closed. NF-5400; Admiralty L1893; NGA 9000. Date unknown. Active; focal plane 6.5 m (21 ft); white, red or green light depending on direction, 3 s on, 3 s off. 7.5 m (25 ft) lantern mounted on a platform supported by four straight piles. Lantern painted white with a red roof. No photo available, but Bing has a satellite view. Located on the south end of an island in the narrow channel between Ytre Vikna and Mellom Vikna. Accessible only by boat. Site open, tower closed. NF-5410; Admiralty L1894; NGA 8972. Date unknown. Active; focal plane 6 m (20 ft); white, red or green light depending on direction, occulting three times every 12 s. 6.5 m (21 ft) lantern mounted on a platform supported by four straight piles. Lantern painted white with a red roof. No photo available, but Bing has a distant satellite view. Located on a skerry off the south coast of Ytre Vikna. Accessible only by boat. Site open, tower closed. NF-5380; Admiralty L1889; NGA 8944. Date unknown. Active; focal plane 12 m (39 ft); white, red or green light depending on direction, 3 s on, 3 s off. 9.5 m (31 ft) lantern mounted on a platform supported by four straight piles. Lantern painted white with a red roof. No photo available, but Bing has a distant satellite view. Located on a skerry southeast of Bondøy. Accessible only by boat. Site open, tower closed. NF-5375; Admiralty L1888; NGA 8940. 1904. Active; focal plane 23 m (75 ft); white, red or green light depending on direction, occulting once every 6 s. 19 m (62 ft) round cast iron tower with lantern and gallery, mounted on a round stone base. Entire lighthouse painted red. A small keeper's house, also mounted on a tall stone base, stands next to the tower. 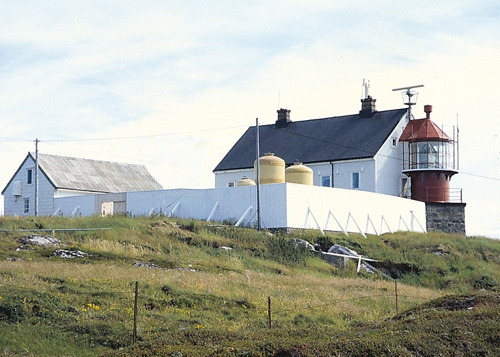 Trabas has Siering's photo (also seen at right), the Lighthouse Association has a page for the light, another photo (last photo on the page) is available, and Google has a distant satellite view. 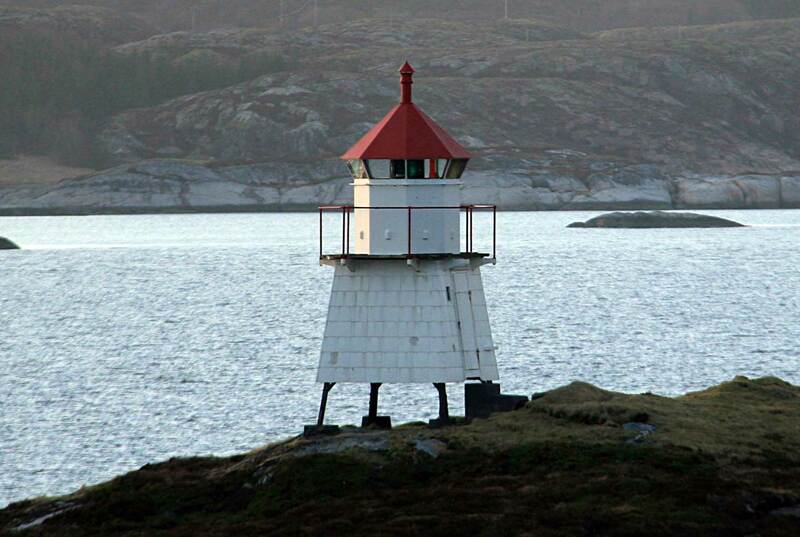 Located on a small skerry about 6 km (3.7 mi) east northeast of the Gjeslingan lighthouse in the mouth of the Follafjord. Accessible only by boat. Site and tower closed. ARLHS NOR-099; NF-5295; Admiralty L1842; NGA 8872. 1877. Active; focal plane 24 m (79 ft); white flash every 10 s; also, continuous red and green lights are shown at 19 m (62 ft) to guide ships around nearby rocks. 24 m (79 ft) round cylindrical cast iron tower with lantern and gallery, incorporating keeper's quarters, mounted on a round stone base. Entire lighthouse painted red. A 4-story white concrete building was built behind the lighthouse in 1938; the building included a boat house, machine shop, and living quarters. Much of the interior of the concrete building has been destroyed by storm waves since the lighthouse was automated in 1987. A photo is at the top of this page, a 2007 photo is available, also a closeup (about 1/5 the way down the page), Trabas has Wöhrn's photo, and Google has a distant satellite view. Wikipedia's article has a historic photo. 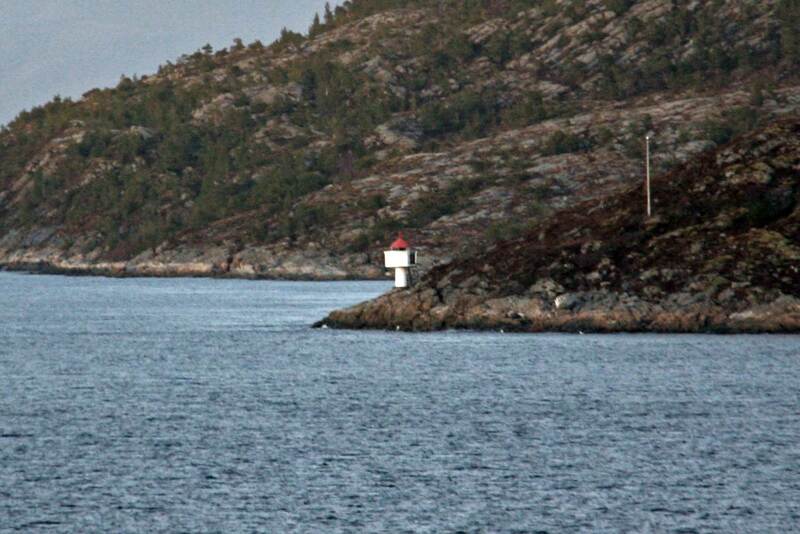 Located on a small skerry in the wide mouth of the Follafjord about 15 km (9 mi) north of Lauvsnes. Accessible only by boat. Site and tower closed. ARLHS NOR-018; NF-5300; Admiralty L1846; NGA 8876. Date unknown. Active; focal plane 7 m (23 ft); white, red or green light depending on direction, occulting once every 6 s. 6 m (20 ft) square tower with lantern and gallery. Lighthouse painted white, lantern roof red. Tom Hanslien has a photo, and Google has a very distant satellite view of the skerry. 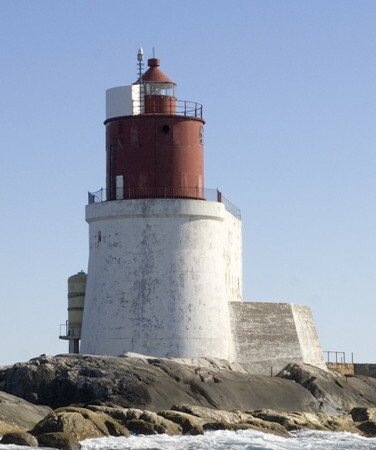 Located about 4 km (2.5 mi) northwest of the Gjæslingan lighthouse. Site open, tower closed. NF-5310; Admiralty L1852; NGA 8880. Date unknown. Active; focal plane 14.5 m (48 ft); flash every 5 s, white, red or green depending on direction. 8 m (26 ft) lantern and gallery mounted on a stone cairn. No photo available, but Bing has a distant satellite view. Located on a skerry about 3 km (1.8 mi) southwest of Heimvær. Accessible only by boat. Site open, tower closed. NF-5317; Admiralty L1856; NGA 8888. Date unknown. Active; focal plane 6 m (20 ft); white, red or green light depending on direction, occulting twice every 8 s. 6 m (20 ft) square pyramidal tower with lantern and gallery. Lighthouse painted white, lantern roof red. Andreas Hamnes has a closeup photo, another photo is available, and Bing has an indistinct satellite view. Located at the harbor entrance of Heimvær, on a small island about 16 km (10 mi) southwest of Rørvik. Accessible only by boat. Site open, tower closed. NF-5315; Admiralty L1854; NGA 8884. 1909. Active; focal plane 8 m (26 ft); white, red or green light depending on direction, occulting three times every 12 s. 5 m (17 ft) lantern and gallery mounted on four straight piles. Lantern painted white with a red roof, piles painted black. Andreas Hamnes has a photo, and Bing has a distant satellite view. Located on a small island about 1.6 km (1 mi) north of Heimvær. Accessible only by boat. Site open, tower closed. NF-5320; Admiralty L1858; NGA 8898. Date unknown. Active; focal plane 7.5 m (25 ft); white, red or green light depending on direction, 3 s on, 3 s off. 6 m (20 ft) square tower with lantern and gallery. Lighthouse painted white, lantern roof red. No photo available, but Bing has a satellite view. Located on a small island about 5 km (3 mi) northeast of Heimvær. Accessible only by boat. Site open, tower closed. NF-5325; Admiralty L1862; NGA 8900. 1890. Active; focal plane 36 m (118 ft); continuous white light with a more intense flash every 40 s. 10 m (33 ft) round cylindrical cast iron tower with lantern and gallery, mounted on a round stone base. The back of the lantern is attached to the 2-1/2 story wood keeper's house. Light tower and lantern painted red, house painted white. The original 1st order Fresnel lens remains in use. Danckert Monrad-Krohn's photo is at right, a 2017 closeup photo is available, and Google has a very distant satellite view. The light is now listed as the rear light of a range with Purkholmen (next entry) as the front light. Located on a small island at the southwestern end of the Nordøyan (North Islands) about 10 km (6 mi) southwest of the principal island of Vikna. Accessible only by boat. Site open, tower closed. ARLHS NOR-033; NF-5335; Admiralty L1874.1 (ex-L1868); NGA 8908. Date unknown. Active; focal plane 7 m (23 ft); white, red or green light depending on direction, occulting three times every 10 s. 8.5 m (28 ft) lantern mounted on a platform supported by four straight piles. Lantern painted white with a red roof. No photo available, and the light is not seen in Google's distant satellite view. Located on an island at the entrance to Nordøyan harbor. Accessible only by boat. Site open, tower closed. NF-5345; Admiralty L1874; NGA 8916. Date unknown. Active; focal plane 14 m (46 ft); flash every 5 s, white, red or green depending on direction. 6 m (20 ft) square tower with lantern and gallery. Lighthouse painted white, lantern roof red. Dag Hallvard Ystgaard's photo is at right, but the light is not seen in Google's distant satellite view. Located on the northern tip of Nordøyan. Site open, tower closed. NF-5351; Admiralty L1882; NGA 8952. Date unknown. Active; focal plane 6 m (20 ft); white, red or green light depending on direction, occulting twice every 8 s. 9 m (30 ft) concrete post with lantern and gallery. Lighthouse painted white; lantern roof is red. No photo available, but Bing has a distant satellite view. 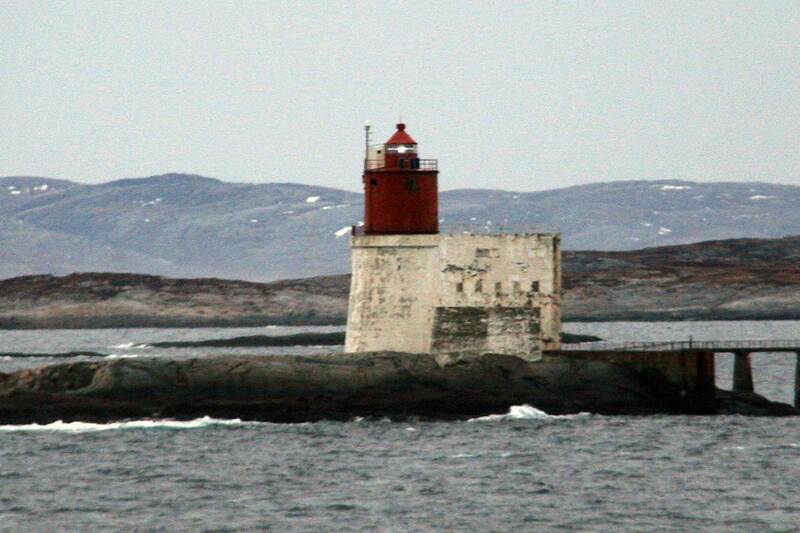 Located on a skerry about 5.5 km (3.5 mi) northeast of the Nordøyan lighthouse. Accessible only by boat. Site open, tower closed. NF-5355; Admiralty L1884; NGA 8924. Date unknown. Active; focal plane 13.5 m (45 ft); white, red or green light depending on direction, occulting twice every 8 s. 6 m (20 ft) square tower with lantern and gallery. Lighthouse painted white, lantern roof red. No photo available, but Google has a distant satellite view. Located on a skerry about 4 km (2.5 mi) northeast of Nordøyan. Site open, tower closed. NF-5353; Admiralty L1883; NGA 8956. Date unknown. Active; focal plane 7.5 m (25 ft); white, red or green light depending on direction, 3 s on, 3 s off. 9 m (30 ft) concrete post with lantern and gallery. Lighthouse painted white; lantern roof is red. No photo available, but Bing has a distant satellite view. 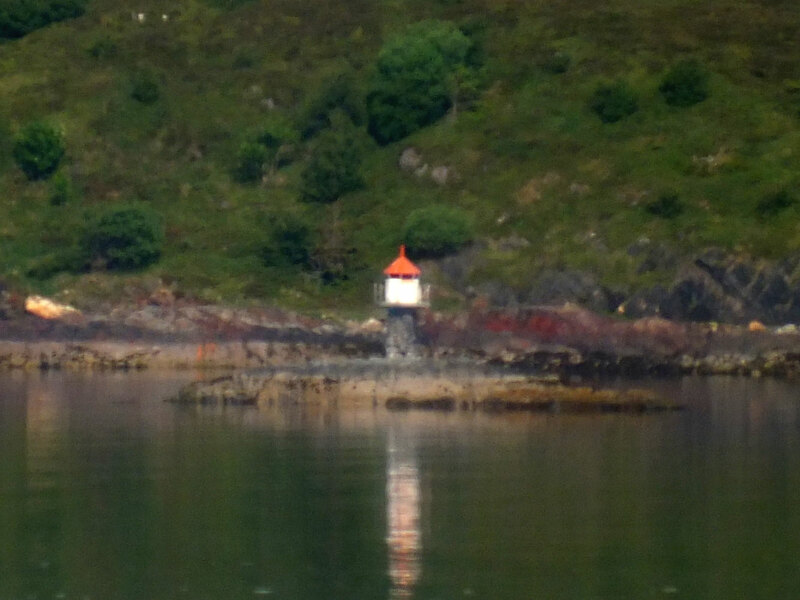 Located on a skerry in the sound between Ytre Vikna and Kalvøy. Accessible only by boat. Site open, tower closed. NF-5445; Admiralty L1895.4. Date unknown. Active; focal plane 11 m (36 ft); white light, 2 s on, 2 s off. 7 m (23 ft) lantern mounted on a platform supported by piles. Lantern painted white with a red roof. No photo available, but Bing has a distant satellite view. Måholmen is an irregular island off the northeast coast of Kalvøy. Located near the west end of Måholmen. Accessible only by boat. Site open, tower closed. NF-5554; Admiralty L1930; NGA 9112. Date unknown. Active; focal plane 26 m (85 ft); flash every 5 s, white, red or green depending on direction. 17.5 m (57 ft) square skeletal tower with enclosed upper portion, lantern and gallery. Lighthouse painted white, lantern roof red. No photo available, but Bing has a distant satellite view. 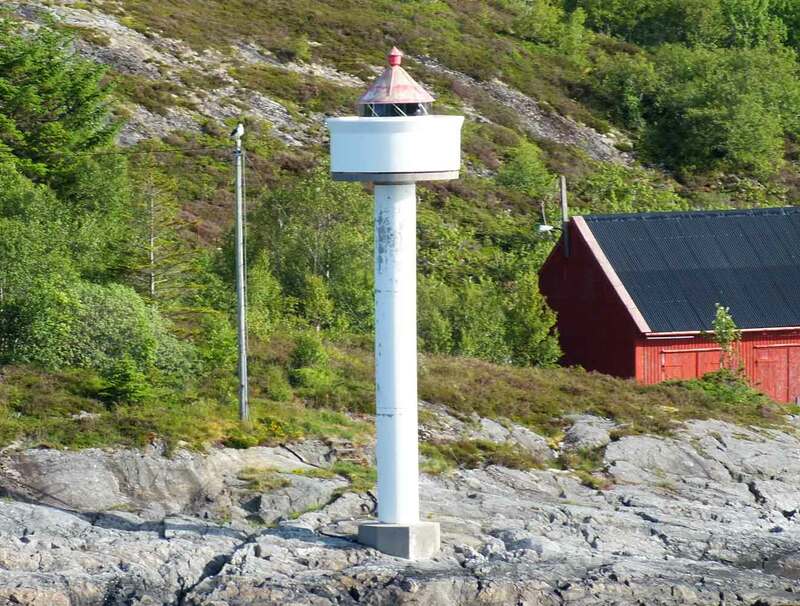 This light is at the location of the historic Måholmen Fyr (1907), which burned to the ground in 1934. A historic photo of the ruins is available, and these ruins can still be seen. Located near the east end of Måholmen. Accessible only by boat. Site open, tower closed. NF-5553; Admiralty L1930.1; NGA 9108. Date unknown. Active; focal plane 13.5 m (45 ft); white, red or green light depending on direction, occulting twice every 8 s. 12 m (39 ft) concrete post with lantern and gallery. Lighthouse painted white; lantern roof is red. No photo available, but Bing has a distant satellite view. Located on a skerry just off the northeast coast of Kvaløy, and island off the northeast coast of Ytre Vikna. Accessible only by boat. Site open, tower closed. NF-5570; Admiralty L1933; NGA 9100. Date unknown. Active; focal plane 8 m (26 ft); white, red or green light depending on direction, occulting twice every 8 s. 6 m (20 ft) square tower with lantern and gallery. Lighthouse painted white, lantern roof red. No photo available, but Bing has a very distant satellite view. Located on a skerry in a narrow passage around the east end of Indre Vikna. Site open, tower closed. NF-5542; Admiralty L1924; NGA 9072. Date unknown. Active; focal plane 15 m (49 ft); white, red or green light depending on direction, occulting three times every 10 s. 6 m (20 ft) square skeletal tower with lantern and gallery, covered with siding. Lighthouse painted white; lantern roof is red. Trabas has Wöhrn's photo, another photo (last photo on the page) is available, and Bing has a satellite view. Located at the southeastern end of the island of Svinøy. Site status unknown. NF-5535; Admiralty L1918; NGA 9056. Date unknown. Active; focal plane 7 m (23 ft); white, red or green light depending on direction, occulting twice every 8 s. 5 m (17 ft) concrete post with lantern and gallery. Lighthouse painted white; lantern roof is red. Trabas has Wöhrn's distant view, and Bing has a distant satellite view. Located on a bluff on the north side of Kvingla, marking a very narrow point of the inside passage about 10 km (6 mi) northeast of Rørvik. Site status unknown. NF-5531; Admiralty L1916; NGA 9052. Date unknown. Active; focal plane 28.5 m (94 ft); white light, 3 s on, 3 s off. 7 m (23 ft) square skeletal tower with lantern and gallery, covered with siding. Lighthouse painted white; lantern roof is red. No photo available, but Bing has a satellite view. 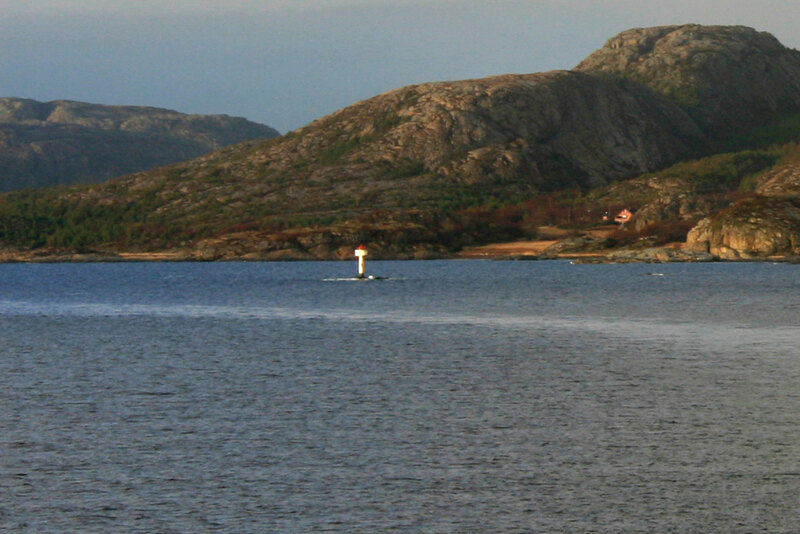 The range guides vessels approaching the north end of the Nærøysund from the open sea. The front light is in a small lantern. Located on heights near the western end of the island of Gjerdinga. Site status unknown. NF-5536; Admiralty L1920.1; NGA 9068. Date unknown. Active; focal plane 8 m (26 ft); white, red or green light depending on direction, occulting twice every 8 s. 9.5 m (31 ft) concrete post with lantern and gallery. Lighthouse painted white, lantern roof red. Trabas has Wöhrn's distant view, and Bing has a satellite view. Located on a skerry in the Risværfjord, a section of the inland passage south of Dolma. Accessible only by boat. Site open, tower closed. NF-5623; Admiralty L1949; NGA 9160. Date unknown. Active; focal plane 13 m (23 ft); flash every 5 s, white, red or green depending on direction. 12 m (39 ft) concrete post with lantern and gallery. Lighthouse painted white; lantern roof is red. No photo available, but Bing has a distant satellite view. Located on the largest of a group of small islands about 8 km (5 mi) south of Sklinna. Accessible only by boat. Site open, tower closed. NF-5580; Admiralty L1934; NGA 9096. 1910. Active; focal plane 45 m (148 ft); white, red or green light depending on direction, occulting once every 6 s. 14 m (46 ft) round cast iron tower with lantern and gallery, painted red. The original 2nd order Fresnel lens remains in use. 1-1/2 story wood keeper's house, engine house, and other light station buildings also preserved. A photo is at right, a closeup and a more distant view are available and Bing has a satellite view. Sklinna is a former fishing village, abandoned in the 1890s; the area is now a protected nature reserve. Located at the highest point of the isolated island of Heimøya, easternmost island of the Sklinna archipleago, about 15 km (9 mi) north of Vikna. Accessible only by boat. Site open, tower closed. ARLHS NOR-207; NF-5600; Admiralty L1936; NGA 9128. Date unknown. Active; focal plane 9 m (30 ft); white, red or green light depending on direction, occulting twice every 8 s. 6 m (20 ft) lantern mounted on a platform supported by piles. Lantern painted white with a red roof. No photo available, but Bing has a distant satellite view. Located on a skerry at the north entrance to Sklinna harbor. Accessible only by boat. Site open, tower closed. NF-5602; Admiralty L1940; NGA 9136. Date unknown. Active; focal plane 5 m (17 ft); white, red or green light depending on direction, occulting twice every 8 s. 6.5 m (20 ft) lantern and gallery mounted on a stone cairn. Lantern painted white with a red roof. Trabas has Siering's distant view, and Bing has a distant satellite view. Located on a skerry in the inland passage off the south side of Madsøy. Accessible only by boat. Site open, tower closed. NF-5645; Admiralty L1960; NGA 9184. Date unknown. Active; focal plane 5 m (17 ft); white, red or green light depending on direction, occulting twice every 8 s. 6.5 m (20 ft) lantern and gallery mounted on a stone cairn. Lantern painted white with a red roof. Odd Selboskar has a distant view, and Bing has a distant satellite view. Located on a skerry in the eastern entrance to the Frøviksund, the passage between Madsøy and Leka. Accessible only by boat. Site open, tower closed. NF-5654; Admiralty L1968; NGA 9200. 1911. Active; focal plane about 5.5 m (19 ft); white, red or green light depending on direction, occulting once every 6 s. 6 m (20 ft) square tower with lantern and gallery. Lighthouse painted white, lantern roof red. No photo available, but Bing has a distant satellite view. Located on the waterfront at Leknesvika, a small port on the northeast coast of Leka. Site open, tower closed. NF-5660; Admiralty L1974; NGA 9208. Date unknown. Active; focal plane 10.5 m (34 ft); flash every 5 s, white, red or green depending on direction. 6.5 m (21 ft) square tower with lantern and gallery. Lighthouse painted white, lantern roof red. No photo available, but Bing has a distant satellite view. Located on the northernmost of a chain of small islands and skerries in the Hortafjord, a broad passage north of Leka. Accessible only by boat. Site open, tower closed. NF-5664; Admiralty L1982; NGA 9216. Date unknown. Active; focal plane 7.5 m (25 ft); white, red or green light depending on direction, 3 s on, 3 s off. 9 m (30 ft) lantern mounted on a platform supported by piles. Lantern painted white with a red roof. No photo available, but Bing has a distant satellite view. Located on a skerry at the southern end of the Horta Islands, about 16 km (10 mi) northwest of Leka. Accessible only by boat. Site open, tower closed. NF-5670; Admiralty L1984; NGA 9220. Date unknown. Active; focal plane 7 m (23 ft); white, red or green light depending on direction, occulting twice every 8 s. 7 m (23 ft) lantern and gallery mounted on a stone cairn. Lantern painted white with a red roof. No photo available, but Bing has a distant satellite view. Located on a skerry at the southeastern corner of the Horta Islands. Accessible only by boat. Site open, tower closed. NF-5671; Admiralty L1986; NGA 9224. Måholmen (1907-1934), Vikna. 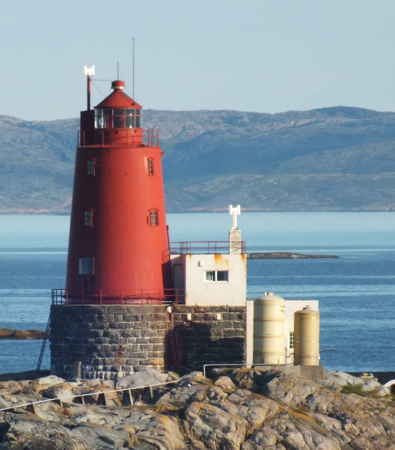 This lighthouse was destroyed by fire in 1934, and it has since been replaced by the rear light of the Måholmen range (see above). Bing's satellite view reveals that the ruins of this station can still be seen. Prestøy (1841-1904), Vikna. Replaced by the Nærøysund lighthouse; only foundation ruins remain. Bing has a satellite view. Posted August 3, 2006. Checked and revised July 30, 2018. Lighthouses: 39. Site copyright 2018 Russ Rowlett and the University of North Carolina at Chapel Hill.